RTE director general Noel Curran said further cost reductions will be introduced next year. 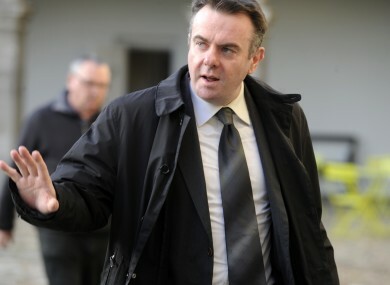 RTE DIRECTOR GENERAL Noel Curran has admitted the station’s stars are being paid “too much”. Curran told an Oireachtas Communications Committee the station had reduced the pay of its top 10 presenters by more than 30 per cent in the last five years. However, he conceded the contractual salaries paid to celebrities caused “considerable public debate and criticism”. “During the boom the remuneration of the top presenters became too much,” he said. There have been reductions in contractual payments ranging from 21 per cent to 68 per cent, according to the station chief. Late Late Show host Ryan Tubridy has seen his fee drop from €723,00 in 2011 to €498,000 last year. Television and radio broadcaster, Miriam O’Callaghan, had her contract reduced from €307,000 to €211,000. Marian Finucane, who presents a two hour radio show every Saturday and Sunday, is paid €295, 000 down from €492,000 in 2011. The station will record a €60 million deficit for 2012 due to a “once off” restructuring cost and Curran said there will be a need for further cost saving measures next year. The average RTE salary is €55,000, excluding contractual payments to stars, and bonuses are no longer being paid by the station. However, incremental payments have been reintroduced for staff below management level. The committee heard there had been a 21 per cent reduction in staff in the last five years and further personnel cuts are expected in the future. Curran said the station “found the first half of the year unpredictable” and it had looked at “remedial cost reduction action” for the coming months and following year. Curran was criticised by Fianna Fail TD Timmy Dooley for not publicly advertising the chief financial officer position currently vacant at the station. The RTE boss said the post had been advertised internally where he believed there was enough talent to fill the position. Email “RTE stars paid "too much" says station boss”. Feedback on “RTE stars paid "too much" says station boss”.